Russia's extravagant spending on the 2018 FIFA World Cup has been the subject of derision, particularly in the wake of soaring costs and construction delays. 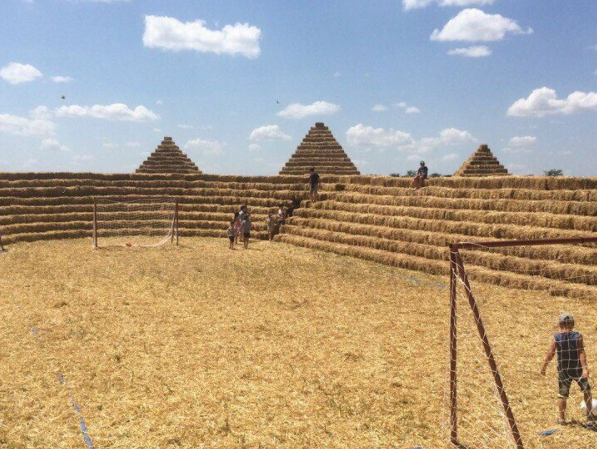 One group of Russian farmers decided to channel their anger into something constructive (pun intended) — a stadium made of straw. Providing a good example of cost-effective and efficient building, the farmers from the Stavropol region built their own Zenit Arena over the course of five days, at a cost of 40,000 rubles ($673). Their choice of name is a swipe at St Petersburg's new Zenit Arena, which has faced criticism for its huge cost, delays to construction, and poor building site conditions. Much of the funding for the real Zenit Arena comes from public-private partnerships between the Russian government and large corporations. “At first [the authorities] said that the [St Petersburg] stadium would cost 6 billion rubles ($102 million), then 48 billion rubles ($812 million); finally, it turned out that it hadn't even been completed yet. [Our straw stadium] is intended to mock this debacle,” said Roman Ponomarev, quoted by The Moscow Times. “Not a single ruble was stolen during the construction of this stadium,” reads a sign at the entrance to the Zenit Arena's straw counterpart. The 2018 FIFA World Cup will take place from 14 June — 15 July 2018 in 11 host cities across Russia.